San LiMi combines the advantages of a strong and spacious motor yacht and adds the luxury of travelling by sail. Being a hybrid, she is not relying on strong winds and can move along, whenever you feel like it. Her impressive leisure and entertainment facilities make her the ideal charter yacht for socialising and entertaining with family and friends. She suits up to eight people in four cabins. The cabins consist of a Master and a VIP cabin each with a king size bed, one double cabin with a queen size bed and one twin cabin with two single beds. Each cabin has a bathroom en-suite and comes with an A/C. San LiMi carries three crew cabins for up to six crew members. San LiMi features a wide variety of toys. Literally, you cannot get bored aboard. 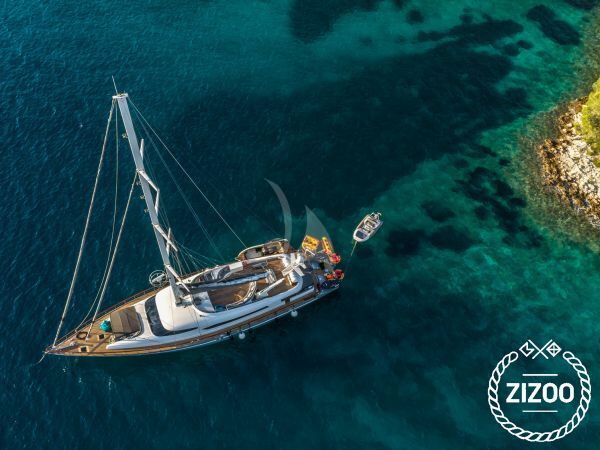 San Limi is ready for your charter request in the mediterranean sea along the Croatian, Montenegrin, Italian and Greek coast.